Those of you who have read my blog before know that I live in Gascony, SW France. You also know that I am completely mad about the cuisine of this gastronomic region. This is the home of Armangac and of all things duck. The food here is robust, it is rustic and it is hearty. What I really respect is the notion of no waste. They use just about every morsel of a duck and they are far more open to offal of any sort on the whole than we Brits. They honour the animals by eating every last bit of them. Just as it should be. There is a real sense of history and tradition here when it comes to food. Just this week I went for dinner at my neighbours house and they cooked me a Pot au Feu – in a stunning weathered black pot hanging right over the burning logs of their open fire. Such a simple dish but utterly delicious. They offered up 5 different cuts of beef, braised for 5 hours with unfussy chunks of vegetables. Honestly, I was in heaven. I am a big fan of the Winter dishes here. The rich stews and daubes, the cassoulet and the gratins and panades. Fortifying and unpretentious, making Winter so much more bearable. 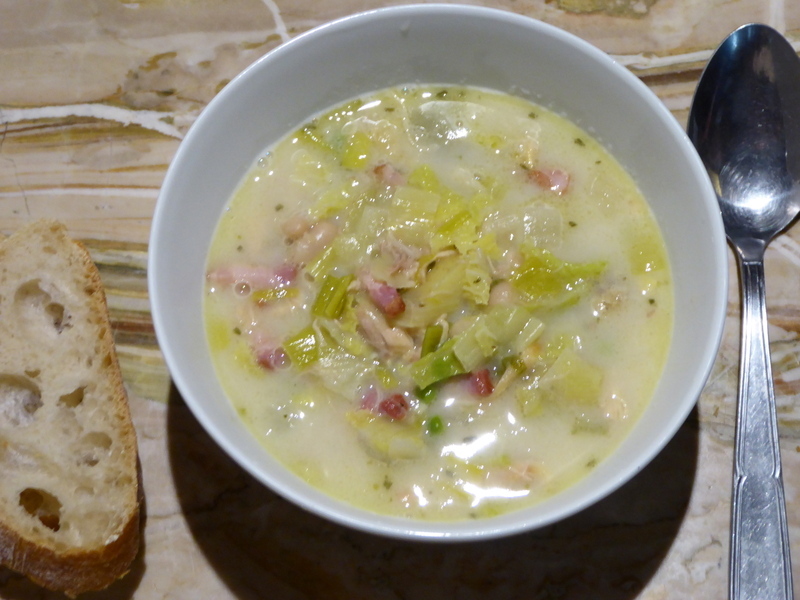 Another such local speciality on my Winter wonder food list is Garbure – a sort of cross between a soup and a stew. Traditionally made with shredded confit duck meat and loaded with vegetables and haricot beans. It is so easy to make and will surprise you with it’s depth of flavour. Not to mention that it is cheap to make and goes an awfully long way. It’s a dish that would have been cooked in a big pot over the fire which could bubble away for hours, adding whatever bits and bobs of vegetables there was depending on the season. A peasant dish, undoubtedly made over and over again in the farmhouse kitchens of the many old houses round these parts. A dish that has stood the test of time and for good reason. So, why not make a Garbure using chicken? I was a little worried that it might not have the same powerful flavour without the duck, so I opted to add lots of garlic and rosemary. 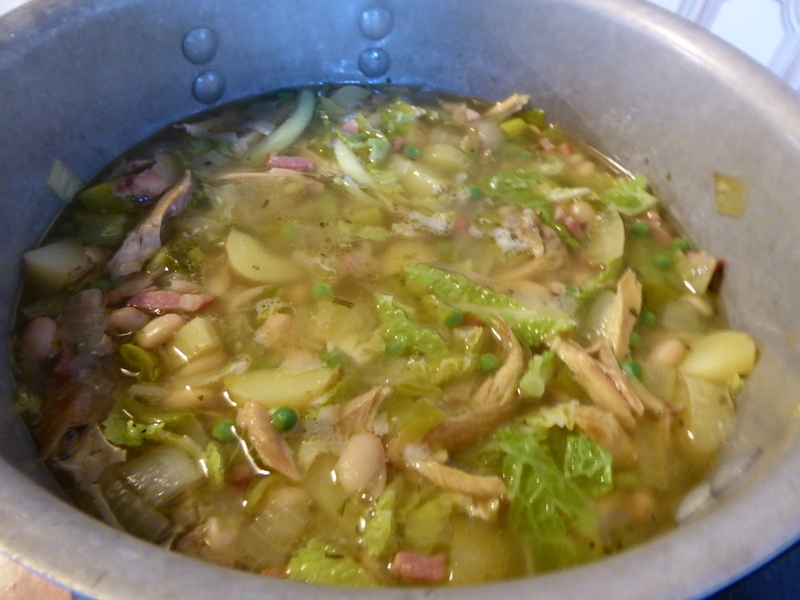 I used the shredded meat from two leftover chicken legs and by the time I had crammed the pot full with bacon, onions, potatoes, leek, cabbage, peas and haricot beans, the resulting Chicken Garbure gave me 8 hearty portions! Trust me on this one, what might seem to be just a big pot with various stuff thrown in with not much thought, is in fact one of the most delicious, value for money, and comforting dishes I know. A Gascon great – this is Winter super food at it’s best. In a large pot, heat your duck fat and fry your onion and lardons for 5 minutes. Then add your garlic and rosemary and cook for 2 minutes until it all smells divine. Add your new potatoes and leek and pour in the chicken stock. Leave to gently simmer for 25 minutes. Once the potatoes are cooked through, add your cabbage, beans, peas and chicken and heat through for 5 minutes. Stir in the creme fraiche and serve,. This soup will keep in the fridge quite happily for a few days. I am entering this recipe into a competition Destinology Reimagine a Classic competition. I think my chicken Garbure fits the bill. 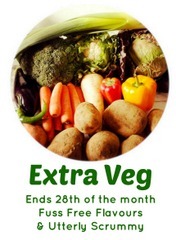 I am also popping it into the following blogging challenges: Extra Veg hosted by Utterly Scrummy Food for Families & Fuss Free Flavours. And Credit Crunch Munch hosted by Fab Food 4 All & Fuss Free Flavours. 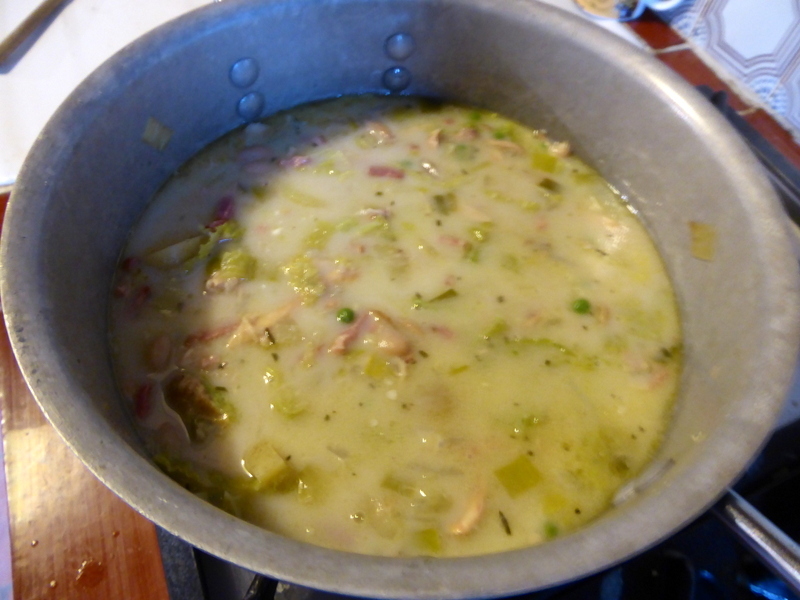 16 Comments on "Winter Wonder Food – Chicken Garbure"
Hmmm, Yes! It must be the crème fraiche that gives this stew a nice creamy look to it. Glad to see your blog posts again! that sounds a tasty rib sticking soup. I love the use of duck fat too. only in Gascony! Your garbure variations here sound very fine to me and this would go down very well indeed on a January day. Garbure makes me very nostalgic for days spent in the south west. It always seems particularly memorable when served from huge pots at communal village meals accompanied by local wines served in plastic bottles. Happy days. Incidentally it’s a little easier to buy duck confit in England these days – Waitrose even have their own brand, although I haven’t tried it so I can’t say if that makes me nostalgic too. Looks really good, I’m curious how it tastes! Thank you! It is creamy and comforting and chickeny!!! Very yummy ! I’d love to doing it ! It’s look delicious.. Can’t wait to .. Very nice to catch you here Madame .Anne ! We’re going to try the Garbure this evening – it’s a beautiful chrisp day here in the North Cotswolds. We’ve still got some duck that we brought back in the Autumn, but sadly very little wine (I always underestimate how much we go through!). We have a house in Fources and are looking forward to returning soon. Do you shop in Condom – I think I may have seen you and the children there (and once asked you which was the dry sparkling wine! )?